TOKYO, Nov 18 (Reuters) - There are no concerns about playing in Fukushima related to the prefecture's past nuclear accident and whether to hold Olympic games there will come down to the facilities and scheduling, the president of the World Baseball Softball Confederation said. 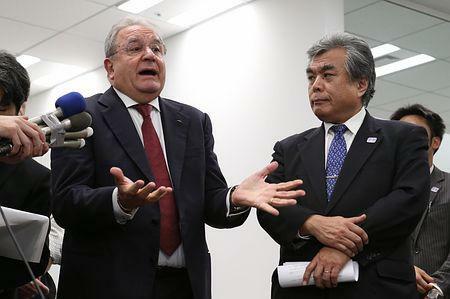 Riccardo Fraccari said in Tokyo on Friday that he would inspect potential playing venues the following day in Fukushima, which the confederation is already familiar with because it held the under-15 Baseball World Cup there this summer. "I know the importance of baseball and softball in Japan and know how it can facilitate the recovery of the disaster area," he told reporters after meeting with Tokyo 2020 President Yoshiro Mori. "So if the fields in Fukushima will have all the requirements then we can take it into consideration," he said, adding that nothing was decided yet and other factors must be weighed including the distance from Tokyo and scheduling. Tokyo 2020 organisers last week approved a plan to hold part of the baseball-softball competition in Fukushima prefecture, roughly an hour and a half north of Tokyo by bullet train. Parts of the prefecture were devastated by the March 2011 earthquake, tsunami and nuclear catastrophe, and organisers are keen to play a part in helping the region get back on its feet. Tokyo 2020 will require the WBSC's approval before it presents location proposals to the International Olympic Committee. The IOC would then make a final decision at its executive board meeting next month. Fukushima City, Koriyama and Iwaki are the prefecture's candidates to host baseball and softball, which are returning to the Olympics for the first time since Beijing 2008. The 2020 Tokyo Summer Olympics will come nine years after a massive earthquake struck northeastern Japan and unleashed a tsunami that triggered meltdowns at the Fukushima Daiichi Nuclear Power Plant. Some areas within an exclusion zone around the plant will remain uninhabitable for years to come, but elsewhere in the prefecture radiation is at safe levels. "From the data I have received, the situation now is not dangerous in Fukushima. Even in the under-15 World Cup just one country refused to come, but the rest were there," Fraccari said, adding that the situation was already good now and the Games were still three years away. "I think the main issues are facilities and the schedule," he said. "Fukushima is a perfectly nice place where you can go.